For the third or fourth time over the last year and a half, a children’s or YA title has been the center of a controversial discussion regarding whether or not its publication respects or disregards authentic diverse voices in children’s literature. Then, less than two weeks after its publication, Scholastic pulled A Birthday Cake from circulation, in a move that was both lauded and questioned. And while A Fine Dessert is still available on bookstore shelves and in libraries, its author subsequently apologized for her racial insensitivity in a comment post after the blog site “Reading While White” published an essay on the book. This was followed in July by a frantic internet discussion surrounding the negative tropes evoked by the word “tribe” and illustrations of kids with feathers in their hair playing in trees in There is a Tribe of Kids (Macmillan), a debate well-summarized by Betsy Bird on her Fuse8 blog. The most recent entry into the fray involves Candlewick Press’s decision to postpone the August release of e.E. Charlton-Trujillo’s YA novel, When We Was Fierce. Early reviews of the book generated intense pushback from writers and bloggers of color due to what many deemed stereotypical characterizations and the invented dialect the author created, which for many rang false and raised the question why it was even necessary since the novel’s characters were members of a living community. All of these books received favorable and in some cases, starred, literary reviews in the mainstream media, and I spent a bit of time reading and trying to understand the depth and breath of the discussions swirling around them. I’ve been interested for some time now in supporting diversity in children’s literature, both as an ally and in my own writing. I live in a diverse world and in my books with multiple protagonists, there are characters from diverse backgrounds. Yet as a White writer, who grew up in a position of privilege, I knew that my own inherent biases always needed to be taken into consideration. As I wrote in a recent essay for the Children’s Book Council’s Diversity blog, good intentions mean nothing because intentions are conscious. Biases are unconscious. Yet as I read through all the blogs and posted comments, I began to noticed two common responses cropping up repeatedly. Interestingly, the writers tended to qualify their remarks, claiming to be supportive of members of marginalized communities and their general objections to the books mentioned. 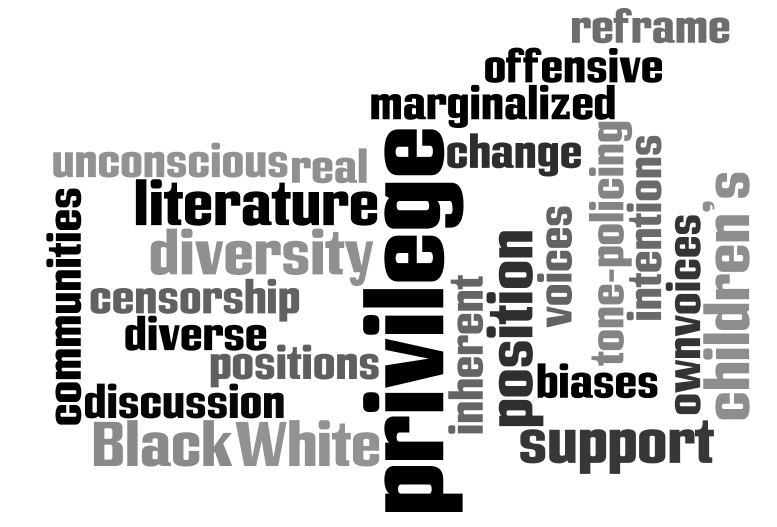 However, their responses, I believe, are just another way that we who are in positions of privilege try, either consciously or unconsciously, to tilt and reframe the complex discussion around supporting diversity in publishing. The first common refrain was the warning call that pulling books off the market because a particular group found them offensive was a form of censorship, and that the power of free speech needed to be defended at all costs. In fact, the situations noted above are not examples of censorship at all. Censorship is the practice of officially examining books, movies, etc., and suppressing unacceptable parts or refusing to make the book, movie, speech etc inaccessible to others because of it. The books discussed in these threads are examples of a very different case, where a business decision was made by the publisher to pull or postpone its own book. To be fair, part of the confusion may have stemmed from the fact that since the books were pre-released for reviews, the content had been read by some but was now inaccessible to others. The second common reaction was tone-policing.This was a more worrisome pattern I saw repeated in response to the legitimate hurt generated for many in communities of color by the privileged. The problem with tone-policing is that it’s the ultimate flipping of an issue. It derails the real argument, and shifts the focus of the conversation away from an ill-conceived decision by someone in a position of power and privilege to the respondent and their reaction. It’s a way of not taking responsibility for your own mistakes while at the same time dismissing another person’s objection by framing it as emotional, angry and therefore irrational. Intentionally or not, it also moves the discussion away from the original oppressive behavior and once again, blames the “other” because they aren’t nice enough or polite enough to voice their protests in a way that can be taken seriously. But you know what? Nobody was ever given rights by politely asking for them. The mistakes that the publishing industry continues to commit makes people angry. And sometimes, anger is what has to happen in order to bring about real change. This entry was posted in diversity, Publishing and tagged censorship, diversity in publishing, tone-policing. Bookmark the permalink.